Hard water stains often appear near sink drains, shower drains and in toilets. These stains are caused by a variety of minerals contained in the water supply. Over time these minerals build up on surfaces and create ugly looking stains. Manganese is one mineral that will create black, ring-like stains in a toilet. 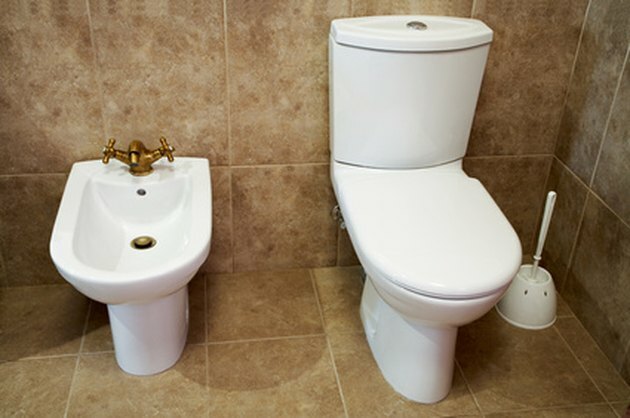 Removing the manganese stains takes a little bit of work and cleaning solutions that you must apply to the toilet bowl. Manganese leaves black stains in toilets. Pour 1 cup of cream of tartar into a bowl, and add 1/4 cup of hydrogen peroxide. Mix the solution thoroughly until it forms a thick paste. Apply the paste to the manganese stains in the toilet by rubbing it on the stains with a toilet brush. Apply the paste as thick as possible to the stains. Allow the paste to sit for approximately 15 minutes, and use the toilet brush to scrub the manganese stains. Flush the toilet to rinse away the paste and to reveal a stain-free toilet bowl. Fill a bowl with 1 cup of baking soda and pour in 1/4 cup of white vinegar to create a mix. Pour in the vinegar slowly as the mixture will foam up quickly. Apply the paste mixture to the stains in the toilet using a sponge or toilet brush. Allow the paste to sit on the stain for 15 minutes, and flush the toilet to rinse away the paste. Fill a bucket with 1 gallon of water, and add 2 to 4 tbsps. of trisodium phosphate, which is available at home improvement stores in both powdered and liquid forms. Pour the entire mixture into the toilet bowl, and allow it to sit for 15 minutes or until the stain is removed. Flush the toilet to remove the trisodium phosphate from the toilet bowl. What Is the Black Stuff Around the Rim of Toilets?